At the Canadian Lakehead Exhibition’s 91st ‘Spring Home and Garden Show’ from April 5th-7th many exhibitors set up their wares to help Thunder Bay Citizens make plans for their home improvements over the good months ahead! Booth No. 28 had been reserved for the Thunder Bay Beekeepers’ Association. I will take you to the show! Children. Children were the inspiration for all the machinations, how to engage them in a friendly way- to invite them into the hive to sit for awhile, to colour and perhaps talk about and learn what they know about what is happening to the BEES. After the take down Sunday evening, it was obvious Thunder Bay understands they can help. Over 150 brochures of “Bee Friendly Plants” had been taken home. High-Five! Well, I think it is safe to say we made it through the winter. Bees are out enforce and I have a coffee and a chair set up to watch. How did we get through? Beeginner’s luck? Perhaps it was the straw bale wind break surround or that I dried out the cedar chip pillows in mid February on a 0° day. I was concerned about air flow as the entrance cleat was at its smallest opening, less than 1″. Hive No. 1, the stronger- curious, no one is using the low entrance…I wonder what mess awaits down there in the bowels of the brood chamber. The big attraction today is a wet towel hanging from the deck railing- are they drinking? Yuk. The wet towel was sopping up the leak we have in the basement. Drag. I will have to change into lighter pants when I go out now to insert 1:1 syrup jars. Last year I got stung through my black tights. Black = scarey animal coming to steal our honey! Will post photos of how the beeyard fared over the winter. Just excited to share the news. Toodles. A bulletin via FaceBook Thunder Bay Beekeepers informed that fellow Member Rudy has lost 3 hives. Bees have starved. Rudy is the “European expert” with many years of beekeeping. Rudy has many hives and sells honey from his acreage on Oliver Road. Eegad. I was worried before I heard about Rudy. We, meaning all of us (Husband, Kaya (the magnificent Dog) and the bees, made it through January and those Arctic Vortexes but I noticed over the last 2 weeks Hive No. 1 “looked quiet”. No bee casualties were to be found laying on the stomped down threshold. I am diligent to sweep aside or shovel snow around the BeeYard. Hive No. 2 always had a few bodies and when I poke their upper exit to clear the ice someone inside gives notice: buzzzz! I have been suspecting an icy “Attic” in No. 1 and have been preparing a new Cedar chip burlap pillow to change up, what I expect will be a ?frozen? one that needs replacing. Luckily, today climbed to minus -5° with that particular February sunshine and I opened No. 1 up, fearing the worst . . .although in the morning I had found 3 bees on the threshold and hoped it was a sign. It was! (and not just stray bees from No. 2) After I lifted off the layers of construction: Roof, top tray of cedar pillow, and top handhold cover of the upper super . . . Ta-Daah! behold the brown mat of bees, quietly buzzing, the candy board still full of white sugar fondant and that’s how you spell joy. The top cover went back on quickly, my toque was stuffed into the hand hold, a quick dash inside for a mohair blanket to substitute as temporary insulation while I cleaned off the ice and dried out the roof interior. It is obvious that the building science performance of this hive is not working, not enough airflow and the resulting condensation is icing the upper levels of the hive. It could be the opening of only 1 inch is not wide enough to draw air at the base. *note to self next year: use 2″ cleat and re-think the straw bale surround . . .I may have created a cold sink also. 😦 Tomorrow’s forecast will also be as warm but with snow. No. 2 will be checked if weather allows and then I have to think of jimmying another design of candy board to slide between the frames of No. 1’s super and No. 2’s situation, whatever I find there. Beekeeping . . . one must have their wits about them and be ready to improvise. But seriously: whew! Author Rita KomendantPosted on February 14, 2019 February 14, 2019 Leave a comment on Disaster averted! The Bees in my hives are wrapped around the Queen in tight balls. I can hear the hum. Winter it is a time of study for Beekeepers and I throw my name into this tribe with emotional humility. With thousands of years of observation , there is a lot to learn and much information to share about these creatures, Apis, the Honey bee. The language of science from a Phd Biologist keeps a person on point. I have new information to share from Heather’s work over the last 15 years from her students at Wellesley (of notable Alumnus: Clinton, Albright, Sawyer) and colleagues from Cornell. – because there is some selection going on – couplings are planned – drones have been selected. Polyamory is a new word in my vocabulary. Today’s women are seeking more than one sexual partner but remaining in their marriage, apparently and Polyandry in Bees ensures genetic diversity, hence stronger . . . busier . . . bees. 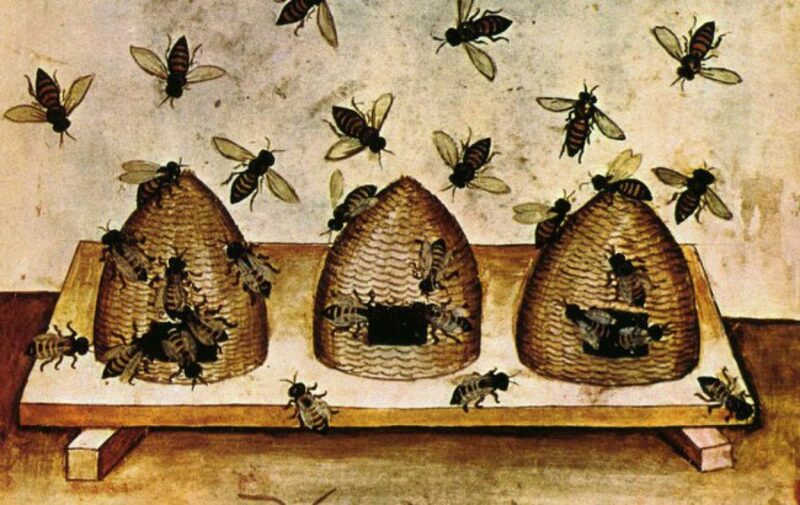 The Queen’s flight away from the hive may occur up to three trips (maximum) in search of an aerial drone congregation travelling many dangerous kilometres to follow the scent of those minute pheromones on the wind. Once located, a mating comet of drones begins to swirl around her and the chase is on. The biggest, the strongest, the fastest Drone wins. Nothing new there >wink<. Back in the hive, the Queen returns and worker bees are reassured by the ultra violet light emanating from the Drone’s still attached genitalia. The workers chew off the package and the colony is restored. Dread. I am filled with dread. In all the winters I have known thus far, this winter ahead will be daunting. The challenge: To keep my bees alive! Today, on a cold and rainy Saturday afternoon (the weather has just been awful for over two weeks now, cold rain everyday!) our Bee Club hosted a workshop demonstrating the Hive wrap-up and treatment of Oxalic Acid, the medication to ‘arrest’ development of the dreaded D-E-S-T-R-U-C-T-O-R Varroa Mite. A ‘drip by syringe’ applied between the frames was voted nay by the also wet and cold membership and we witnessed a demonstration of ‘the vapours’. A heated wand powered by an automobile battery fried up the crystalline version of oxalic granules. The toxic gas was inserted into the base of the hive. A few Bees were able to get the hell out of dodge by flying out, skirting the edges of the noxious plume while others trudged out on their death march. The cure for Cancer, chemotherapy, known as worse than the disease, is the analogy that came to mind. On a happy note, I learned how to make a ‘candy board’. A paste of white granulated sugar, some water and a touch of vinegar is patted into a wood frame with a metal mesh. The hardened sheet of “candy” offers emergency food should the little creatures (those that survived the gas attack) eat themselves out of their honey stores. The bees are already forming into balls in the hives and I can envision those fat drones providing the BTU’s. Some relief is in sight on Thursday when +10 is forecast. I will continue to provide syrup until the end of the month but I will get busy and prepare the custom fit winter cover of 2″ styrofoam @ a value of R10. Both hives are presently waterproofed with white tarps over heavy wool blankets. There is room to innovate in this . . . profession. fyi: Oxalic acid is like the compound found in Rhubarb leaves. Remember you are not supposed to eat Rhubarb leaves. Himalayan Balsam. Rogue plant from, yes, the Himalayas. My bees have been arriving with white ‘spots’ on their backs and I was freaking, “Oh nooo, now what scourge is this? ?” Friends of Mr. Google told me not to worry, it is just pollen from the Himalayan Balsam flowers. As the bee enters the pollen stamen(s) scrapes over their backs! Well thank goodness there is still something nutritious out there for the bees, non-native invasive species or not, at least it doesn’t sting a rash onto you like Giant Hogweed and their ilk. On October 13th, the experienced BeeKeepers of Thunder Bay will be giving a demo on how to wrap up the hives for our gruesome winter. Can I wait that long? I have been feeding them 1:2 sugar syrup and changed up the Mason jars, large bodies with the smaller caps, so there is more of an opening around the handhold lid of the hive cover. My meagre innovations. I also purchased rolls of reflective insulation (the bubble wrap stuff) I was going to make temporary tea cozy-type things until the 13th, I’ll let you know how THAT project materializes. A happy shoutout to Sassafras Farms in the Carolinas https://sassafrasbeefarm.wordpress.com/ , I hope your Farm is OK after the Hurricane, I am almost afraid to ask.